You can set up your Provider branding via 'Customisation' and 'Branding' in your Provider interface. 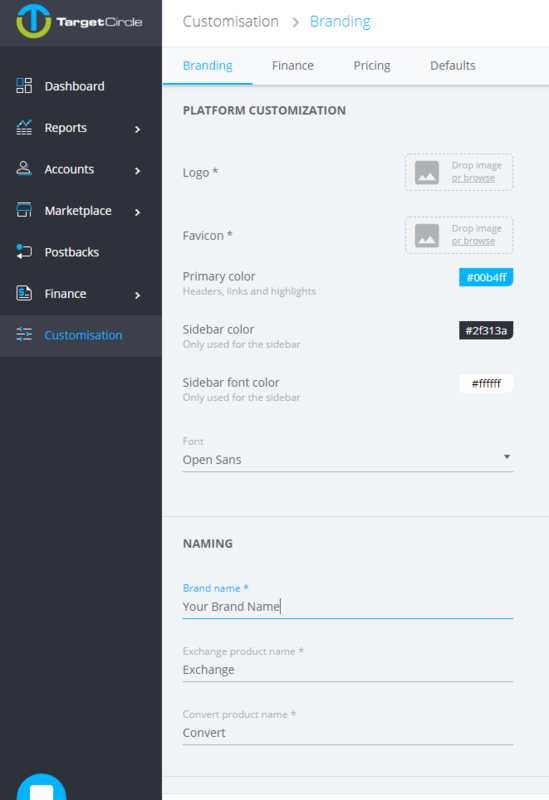 Here you can customize your platform and change the naming of your brand and the products. You can either drop the logo and favicon or select them with the file browser. Logo: PNG or JPG file, preferably a PNG with transparent background. Favicon: PNG or JPG file, preferably 32x32 pixels. Furthermore you have to add the hex codes for the Primary Color, Sidebar Color and Sidebar Font Color. The Primary Color is shown in the headers, links and highlights. To finalize the setup you have to select your brand name and the product names for Exchange and Convert. The brand name will be shown besides the favicon in the browser whereas the product names will be shown on your invoices. Furthermore the product name for Convert will be visible in the interfaces of your Advertisers. Once you are happy with all settings click on Save and refresh the page. Please Note: Your branding will be only visible in your Provider interface and in the interfaces of your Advertisers. All Publishers see the Target Circle branding due to our open marketplace.